We travelled to Spokane for My Mother-in-laws birthday and Mothers Day. I knew that I would have to get in a 16 mile run and should research the Centennial Trail but I was sooo busy at work that I did not have time. Thankfully my father-in-law printed out a map and we had a plan. I wanted to do an out and back and meet the family at Riverfront Park in Spokane. Instead they thought the Valley would be closer to Idaho for linner and shopping, so I would run 16 miles on the Centennial trail. All geared up I took off!! In college I had run a 3 mile loop several times and was really excited to be back on my old stomping grounds. As I passed my Alma mater Gonzaga I felt nostalgic, the parking lot was filled with Gonzaga graduates. I wonder how crossing the Marathon finish line will compare to receiving my 2 diplomas? Just before the little bridge I noticed that that warm-up soccer field we used to do sprints on during pre-season basketball conditioning had been plowed to make more dorms, the University is growing..I was not sad I was tortured on that field. A beautiful day I LOVED being next to the river. I felt strong. I planned to break the run into 5ish mile increments, a race strategy or sorts. I passed the Beau Rivage Apartments, which is where Dave and I fell in love and lived before moving to Puyallup. A lot of great times in those apartments, the memories flooded my head and made me smile. Mile 5, time for a Gu chew and some water. YUMM!! I love the chews and the water was refreshing. The next section was busy for runners, I saw a pretty strawberry-blond-haired runner in bright pink who showed a lovely smile and wave gesture, I LOVE THAT!! Another tall athletic looking lady passed and flashed me the Peace sign, made me chuckle a bit, I would never do that. And finally a round young guy struggled down the road, I could tell that he was determined, I gave him a thumbs up and he muscled up the effort to smile. Keep going buddy I thought. The next few miles were amazing, with blooming trees, green pine, a strong flowing river and yellow goslings learning to swim. Pleasant and wonderful with just enough tree cover that the sun was not too hot, then my Oasis changed. I got to a park and sports complex. The brown signs I had been following were gone and I had no clue where to go. All paths seemed to lead to baseball fields. I should have asked someone, I should have found a map, I should have but instead I followed a biker who was lost as well. She thought the road side was the right way to find the path. BIG MISTAKE. I ended up losing the trail for 4.5 miles and running in a blah section of neighborhoods mostly uphill. 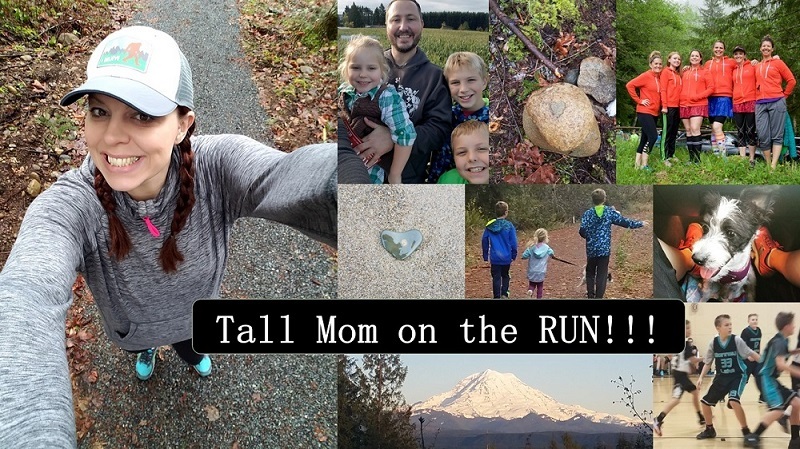 Our plan to meet was shot as time ticked away…I felt my phone vibrate (I got a Nike phone pouch for my arm, I love it) my husband was worried I was supposed to call when I was 5 miles from the finish so they could leave the park and drive my way. I admitted I was lost and would have to get back to him. I was annoyed to stop, I was annoyed I did not turn around and find my way, and I was losing my strength. I asked an old man where the trail was and he told me I was “Way off course” and gave me directions. GEEEZZZ! I could not get my speed up, I could not get my head focused, all I could think of was how stupid I was and that I had left my kids and husband for this. I DO NOT LIKE BEING LOST!! Although I know Spokane I am a landmarks girl. I called my hubby back and told him where I was, I walked as we plotted the recovery mission :) By that point I could barely muster up the strength to keep going, I was so frustrated. Every road looked the same, mile 13.5 I finally found my bearings, the MALL was up ahead. YIPPEE!! Once I knew where I was I called hubby again and said "I will be by the Krispy Cream!" No I didn't need a doughnut, I just needed to be somewhere familiar. I knew I would be short on mileage but I did not want to be lost any longer, I needed to STOP. I am not proud of my stats, I have been beating myself up about it for the past day and a half for not finishing the full mileage and walking a portion...but here we go. Don't beat yourself up! You did an awesome thing making sure you had your run even though you were away from home. Good job. I was away from home all weekend and got fed up half way through my 5km run and went home. You kept going, and that's awesome. Well done, from one Mel to another. What are you using to calculate the number of calories you're burning? Typically, they say running burns around 100 calories per mile (more or less, depending on your weight and your pace). My calorie count for long runs never tops 2,000 until I get close to 20 miles... I'd love to know I was burning more than I thought! Don't be too hard on yourself about not reaching 16 miles over the weekend. Marathon training requires flexibility once in awhile and the ability to work around unexpected changes. Just consider it giving your body a little bit of rest before you reach for the new peak! That stinks about being lost, kinda scary too! I wouldn't like it at all! At least you were able to get the run in! I like it when runners are friendly! Great job considering the situation! I guess running is like child birth in a way...you never know what to expect but in the end you can be really proud of what you did...even though it wasn't what you wanted or expected! I can't wait to hear all about your 1/2 marathing next weekend. Maybe I will try texting you. I am leaving Tuesday until Sunday so I won't be reading blogs! Good luck...you are amazing! I hate the feeling of being lost... especially when I'm out running. Something similar happened to me several weeks ago when I was doing a trail run. All of sudden, the trail ended in a parking lot. I knew the trail went on longer but I didn't know how to find it. Frustrating!! Other than getting lost, it sounds like a lovely run. How fun for you to be able to think up great memories and encourage others as you ran! You did great, in spite of the frustration! Good for you for getting out there and running even when on a mini-vacation. Some running days just don't go well! Don't beat yourself up, you will be fine. And yeah... your time is faster than any 14-er I've ever done ;) You rock. great job on the run. Just remember that you should be running slower on the long run days - your body needs to acclimate to being on your feet for so long. Keep it up!! Can I just say that I love reading your descriptions of your runs! I can totally feel myself there with you! Blog on! !